Where can you deliver your concrete to? Our normal delivery hours are shown, however if you are looking for out of hours deliveries such as night time deliveries we can travel further. Please call us for more information on 01765 635536. 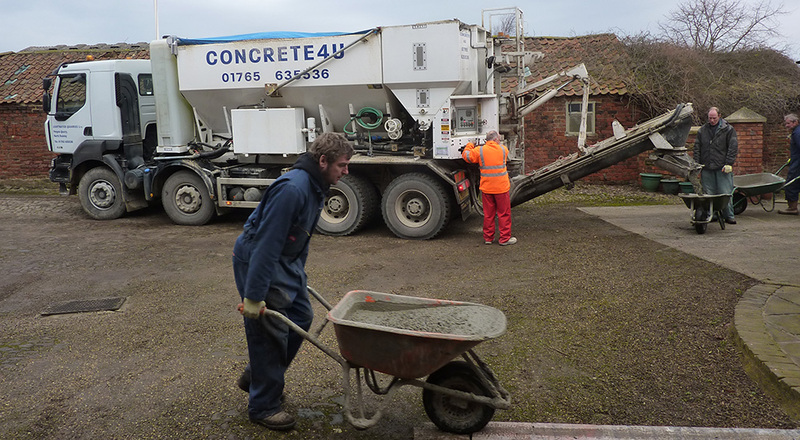 How do I contact Concrete4U ready mix concrete? How much ready mixed concrete will I need? Concrete is supplied in cubic metres. We supply anything from 0.2 cubic metres upwards. Once you have your measurements use our Concrete Calculator to work out how much you need. What mix shall I use? Different mixes are used for different applications, to see our range of concrete by use please click on the following link. Concrete by use. If you require further assistance please contact us on 01765 635536 for advice. In the event that our chute does not reach far enough we provide 2 wheelbarrows for your use to help move the concrete, but we do not provide labour to push the barrows, alternatively a pump may be required, ask us for more information. Our normal working hours are detailed below. 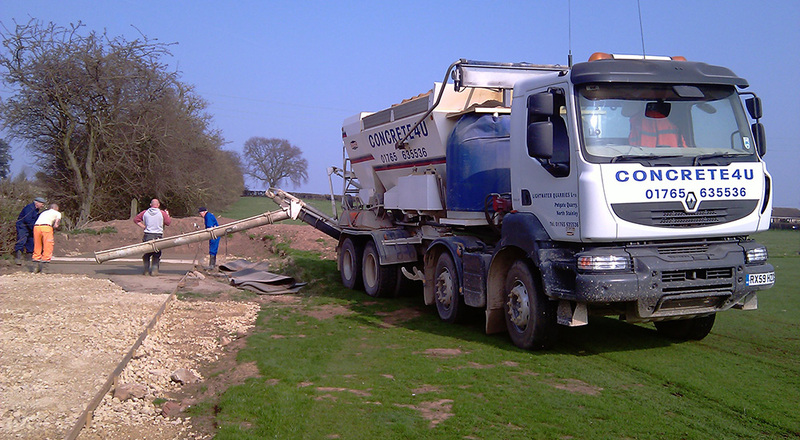 However if we are not open when you want your concrete, whether it is required in the middle of the night or a weekend afternoon just give us a call and we can discuss out of hours deliveries to suit your requirements. We ask for 48 hours notice for all concrete deliveries, the more notice you are able to give us, the better your choice of delivery times. For weekend deliveries as much notice as possible is appreciated. Whatever happens we will do our absolute best to get to you when you need us. Please check that safe and adequate access has been provided, if you are unsure on how much access to allow please see our truck measurements or ask for a representative to call round to advise. Always ensure everyone coming into contact with concrete uses the correct safety equipment and protective clothing and footwear. Wet concrete is caustic and will cause burns if left in contact with skin. Wear waterproof boots and gloves. Wear eye protection. See the concrete care page for more information. It takes approximately 1 – 2 hours for concrete to go hard however setting times are variable and can be dependent upon weather conditions as well as the type of concrete ordered. The concrete will need time and care to cure properly before exposure to traffic. Please see our concrete care page for more information. As concrete can cause burns we recommend wearing protective clothing at all times. Keep your arms covered and do not go into the concrete unless you are wearing waterproof footwear such as wellington boots, if the concrete goes over the top then remove them immediately and wash your skin and your boots. We also recommend gloves and safety glasses. Please see our concrete care page for more information.